Yesterday I announced a new CQ challenge to make a 2020 over the next couple of years. I am delighted to have a good few takers for this challenge so I have heaps of stitching buddies which makes me grin. Today I thought I would share how I have gone about organising and planing for such a large project. I learnt a lot when I made the I Dropped the Button Box quilt and no doubt will learn more with this one. For those who missed it here are the guidelines but just to recap the idea behind a 2020 quilt is make a quilt using 2020 different items such as different fabric, lace, braid, ribbons, doilies, hankies, buttons, charms and beads. One of the attractive aspects about this project is to see how my stitching has changed since I worked the I Dropped the Button Box quilt which is a Y2K quilt with 2000 unique bits on it. Made in the year 2000 revisiting the idea a couple of decades later is an interesting exercise but as I embark on this I also realise that I will face similar creative challenges. To keep it interesting and new this time around I will count ‘bits’ fabric lace etc but I am also going to count varieties of stitches and embroidered seams so it is not a simple repeat of what I have done before. Also instead of making my blocks square this time around I am going to make hexagons. Planing and keeping track of 2020 bits of stuff! A fun part on this type of quilt is to use 2020 different pieces of fabric, lace, ribbon, braid, buttons etc as the quilt has to be made of 2020 unique items or pieces. You get to dig out all your stuff! Because you dig it all out and because you are trying to find things that are unique to meet the ‘all different’ requirement you find your self rummaging in all the nooks and crannies of your stash and finally using that special thing-a-ma-bob that you have hoarded for the last 20 years. So this type of project is a great stash buster. Anyway the first thing I did was dig out all my fabrics. As I went I selected a small piece and then pinned it to my design wall. Tip! Keep everything for this project together in one place. It is quite a challenge not to have duplicates in the quilt. To avoid accidentally using something twice in the quilt I pick out all the stuff that I am going to use and double check it for duplication. So that means going through my stash selecting one of each of the fabrics I am going to use. Then doing the same with lace, ribbon and braids. I have a design wall so I just pin them up until pulled out everything. As I go I select fabrics that may go together so each of these bunches look like this. I wont get to piece all the blocks in one hit but each of these selections goes in a zip lock bag. If I see an obvious match with lace or braid I put them in the bag too as I add laces, ribbons and braids as I piece. If the fabrics and lace are not organised into coordinated blocks I put the whole lot into a big plastic storage tub. The main thing is to keep the supplies for this project separate from my regular stash. It is easy to think as I did with the the I Dropped the Button Box quilt, that you can assemble blocks as you go and pull from your stash as needed. It did cause me troubles. The the I Dropped the Button Box quilt has 100 6 inch blocks each had 20 or so items on them. The first 10-15 blocks were fine as duplicates are easy to spot and prevent when assembling the next block. Once you reach about 30 blocks it is hard to hold in your minds eye what you have used and what you have not used. I have not done this type of project with larger blocks so I would be interested in hearing from anyone who does and if they need to pull out everything first. I also go through all my buttons and make up a box of buttons that hold no duplicates and the same with charms. So everything that I can use on the project is set aside in one place. The other thing I am looking forward to is experimenting with the embroidery a lot more as I hope to experiment with more stitches and more embroidery techniques. To keep track of this and to catch ideas as I think of them I will use a studio journal. So I have a spiral bound A4 art journal sitting on my desk. I chose spiral bound in order to be able to stick in fabric swatches, threads and photos without it getting too bulgy – it will and I might even need a second notebook by the time the project is done but I am tracking it from now. One side of the journal will be me tracking the project block by block and I will turn the notebook over and use the back as the side I store ideas in. When doing this type of large project as I stitch I often thinks of other things I can do – I will note it in my studio journal. Then of course there is stimulation and inspiration of stuff seen online. That too goes in the back of my studio journal. I have over 3 years to make it as technically the deadline for a 2020 quilt is the end of 2020 so it’s not a stressed or hurried project and I was looking for something that was easy to pick up and set down when I wanted to work on something else. After seeing hexies made by Vivian Garforth’s and then Margaret Roberts (both members of Facebook groups Crazy quilt International and Crazy Quilt Divas) I have decided to make hexagons using the quilt as you go method. The next thing to work out was how many hexies I wanted to make. To do this I used a the cddesigns calculator I found online. The calculator measures the side of the finished hexagon. I am using a template that creates a finished side of 4 inches which is 8 inches across from point to point. I like this size as it fits on hoop easily with no worries about having to move the work and crushing embroidery or beads etc. This size also works up relatively quickly. For a long term project like this I am trying to avoid stall points as stall points lead to UFO’s. So for me a handy size block is a way of giving myself the best chance to complete! Using the calculator on the cddesigns I fiddled about with the size of the quilt and came up with the number of 120 hexagons and 11 half hexagons to give me a quilt top that 76 inches by 74 inches. I then divided 2020 ( the number I need to make the challenge) by 125.5 (120 and 11 half hexies) to get the number of items for each block which is 16 unique items per block which I can do. So the composition of my blocks without embroidery will be something like this 5-7 pieces of fabric, 3-5 buttons, 2-3 pieces of lace, ribbon or braid, 1 charm/feature bead and 1 lace motif. These are approximate as I will jiggle what looks best on each block and what works with the embroidery on the block and this time around I am counting different embroidery techniques and seam combinations. One thing that is of concern is that if I pile all that stuff on to each block I don’t have much room for embroidery. Now this number is good in theory but if I get very wrapped up in lots of embroidery I will need more room on the block! This means the final count of 2020 items may fall short. If this happens my solution is to add more more hexies and have bigger quilt. So in the long run, I am not sure yet as to final number of hexies but they will be around 120 or more if required. I will be counting and recording in my studio journal. Well thats the plan – Comments and discussion welcome in the comments below. My next post on this will be hopefully be sharing my first block! Admins on the two big Facebook groups Crazy Quilt Divas and Crazy Quilt International are more than happy for people to share there work there. For those who have blogs you can leave your web addy in the comments. Instagram people can use #2020crazyquilt to share progress photos. This sounds like a fun! Sharon, I finally found your page and have written down details. I have been dong Crazypatch work for 20yrs plus. Did you get my comment ‘up for the 2020 challenge’? Please add me to the list of takers. What fun. When I figure out how to post pics,I will do so. Cheers from Aust. I decided to do the challenge and am so invigorated – first time in a very long time. I think I am going to do an applique crazy quilt – lots of opportunities for different fabrics and embellishments. I am considering doing a fabric book journal, but not sure – it might become more of a distraction rather than a help to me. Looking forward to seeing what everyone else is doing! HI Phyllis – applique will certainly be an interesting embellishment – have fun with it. I just received your book today — it’s wonderful! You must stitch 20 hours a day to get all that accomplished. I have a question about how to count things. If I use a seed bead to make a flower on one patch and I use the same seed bead as a seam treatment on another, does that count as two items? Even though nobody would notice because of the huge size of it all, I want to stick to the rules. 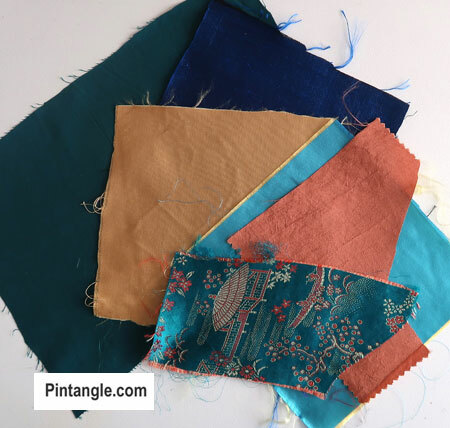 I noticed that in the photo you posted of all your fabrics you seem to have a majority of plain or tone on tone fabrics, with not a lot of coloured pattern pieces. Is this so as not to take away from the embellishments. I have started going through my stash but I am having trouble with the design element of the process. It is actually a little scary to think that I will probably have no trouble finding that many items to do a quilt. Hi Sharon, you must have read my mind! I am about to start a crazy hexi for an art exhibition in 2019,inspired by a wall hanging I saw recently. Your posts have given me hints I needed to get organised (I rarely am!). I have a huge stash of silks, velvets and luxury fabrics, being an ex-bridal and formal wear dressmaker, so it will be fun to gather up all my lovely bits to create this piece of textile art. Thanks for the inspiration! I would like to take part in this challenge. I had started a crazy quilt a few years ago when I was first diagnosed with PPMS. I think this will inspire me to work on it again. I may not get it done but I will give it good try. Look forward to seeing everyone’s quilts. I have two large tubs filled with satins, velvets, and all sorts of goodies to use in a crazy quilt, but have never gotten up the nerve to do it, until now! Cannot wait to get started. I’ve decided to jump in with both feet and give this a try. I’ve been looking for a new quilting challenge and this is going to be it. When you first announced it I was somewhat overwhelmed by the scope of the project but after you shared your organizational process in the following post I felt I had the framework for making it successful (the long timeline was also a big factor). Still considering whether I want to have a unifying theme other than 2020. I’ll have to see if anything reveals itself as I started wading through my stash. Can’t wait to get started!! Let’s see, I will be 83 at the end of Dec. 2017. And by at the end of 2020 I will be 86. If I start this project and don’t live to finish it–oh well, whatever. But if I live until the end of 2020 (which I plan to do just so I can finish the project)and don’t start it, I will still be 86. In the meantime, think of all the fun I’m going to have! My stitching should have improved too! Kathy I have been asked that on Facebook – ie if you could count thread – I am tempted to count types of thread as using various threads can really add a lot to a quilt but I am not sure how I would track it well. I don’t trust myself to not make a mistake, but if people want to they can for sure! Particularly if they are doing different seam/motif embellishments as part of the challenge. I still might count specialty threads myself! 2. the difficulty, to find the right fittings items together. 3. I like to have a colourtheme, but that would be hard to find wenn using so much unique things. hmmm, … the easiest is the colourtheme: I can use a bit of red, white (creme etc.) and gold in each block – blocks should be small and square for a quick success. So point 2 and 3 are clear. As I know myself I have to prepare small bags for each block for not to leave the overview, so first I have to sort out the “on top items” (lace, buttons etc.) and than the fabrics. you say ” I hate the mess when I shall put out 2020 things” Yes I dont want to live with stuff everywhere either – I sort everything out then I put it in plastic bags and a big plastic storage tub so they stay together but I do not have to have everything out. You say “the difficulty, to find the right fittings items together” do you mean storing them together or making the block? Storing things as you work the project a zip lock back with solve the problem – if mean co-ordinating the blocks that is the challenge. Getting things to balance and be in harmony is part of the skill of crazy quilting its the fun creative challenge. You mention you would like to theme by colour but “that would be hard to find when using so much unique things.” Yes so what you do as you sort out your things that you are going to use is put them in pile by colour – so all blue fabric, lace, ribbon, braid, buttons etc are in one pile and all red fabric, lace, ribbon, braid, buttons etc are in another and so on. Then make up your blocks from those. You are not likely to make up all the blocks in one sitting so keep them in plastic bags. You say you don’t want to have another UFO- which is fair enough. That is why I started the challenge as it helps people stay interested but if you really dont want another UFO do the blocks using a quilt as you go technique then if you only work half the blocks you can still assemble them and bingo you have a quilt! 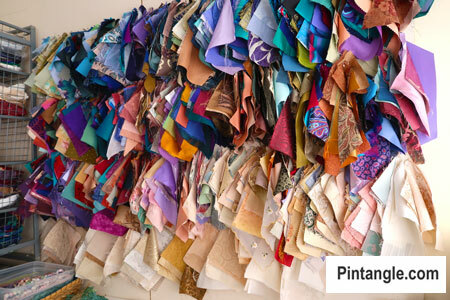 In my head grow up some ideas, I can see the not yet pulled out fabric piles – perhaps a fan-block is my choice. Letting the thoughts turn around a little more, but I have a first positiv vision. Kerstin keep growing up the ideas and pulling fabric that is how big things get done! I have a question about colors/unifying the quilt. I am wondering how to unify the piece if I use all the colors of a rainbow on the quilt? Sashing between the blocks? I am afraid of a hot mess when I am done.. Just curious. I dont like to peddle but my book has large section on design and that will stop it looking like a ‘hot mess’ as you say – thinking about the design of each block prevents that chaotic ‘oh that is too much’ look. Thanks Sharon! I have your book although I loaned it to my librarian friend to look at so she can order one for our library. I did a quick flip through but need to read the design section. When I read the challenge I thought how neat, but too big of a committment for me. However, reading how you are organizing, etc.. I’m thinking I can do it or at least try to do it! Reading all of the comments is very encouraging also. I’m finishing up a wallhanging for my daughter, but think I will start organizing my items. I had trouble with the block for my daughter’s as the sizes were off. How do you keep yours from not shrinking? Just a larger margin around the block but that would still not have all the same dimension. Perhaps I need to stitch not so tight? Any suggestions in this area. Would love to do hexies but am concerned about matchinng the seams. Hi Deborah Usually if your blocks shrink as you stitch it is a tension problem. I use a hoop and rarely have an issue. If you cant bare to use a hoop for your embroidery then make the blocks little larger and trim them to size after you have finished the embroidery. You have just given me ideas galore and the way you organised the mathmatics of the quilt size and each blocks requirements has given me the waiy to do same with a quilt that is radttling in my disappearing grey matter. The 2020! Quilt will be followed by many and I will be one . Thank you Sharon, you are one of the most orgaised women, I know! Belinda – me organised? Nah I just work very hard a looking organised…. This sounds very exciting, not sure I’m ready to jump in yet as still learning but I will follow with interest & hopefully feel confident enough later to join in. Awaiting delivery of your book . so interesting reading what yo are all planning to do, the mind boggles can I do this well I can try! ok.. deep breath. what a commitment! Still i have lots of supplies which have been built up over vast years. I am flexing my fingers and saying ‘You can do this’. soooo.. I’ll just ion and say ‘Im on board’. You book hasn’t reached me yet in country town Aust. Still I hope it will get here soon. Ok, I am going to join this challenge. Just received your book today-bravo! I don’t think my skills are up to 125.5 hexies so I will have to do blocks. I was just looking at your blocks for the Button Quilt and think I may have to make it easier on myself and do blocks that are very similar in the fabric placing. Could you show a page or two from your journal for organizing too? I couldn’t quite see what you meant when you wrote things down. HI Beth – blocks are easier than hexies I agree and they can also be small – the button box quilt blocks were 6 inches so I had lots of little wins along the way as I did each block. If you are trying to get back in the groove – small wins are great to help that. I will be sharing journal pages – diagrams what stitches I use and linking them to tutorials etc I learnt a lot with the button box quilt and learnt a lot when I blogged it about what people liked to read about. I started blogging about it after it was made so lots of stuff was not photographed so I did not blog it. This time around because I am making it as I blog it I am going to share the whole design process. Hopefully it will helpful for people. Ok. I have wanted to do a crazy quilt for ages. Have more than enough supplies-well, I may need some muslin. I just received your new book. Bravo! I don’t think I am brave enough for hexies. Will have to “cheat” and look at your Button quilt and gather ideas for my quilt. I think I need larger blocks with more stuff rather than 125.5 blocks with 16 items for each. 125.5 makes me quiver in fear. This sounds very interesting, I’m sure I will enjoy following this challenge. Maybe your journey will help me to work on my Crazy White again. Is it too late to sign up? This sounds like soooo much fun! I have been meaning to de-clutter a bit. Or maybe it is just a really good excuse to go shopping – huum. Phyllis people can start anytime – so no you are not too late. Fit it in with your schedule – no stress, just enjoy! This looks like the perfect project to start when I retire in August. I will start on pulling fabric from my huge fabric collection in the coming weeks! Can’t wait to start! What would be a good size for a square block? Thanks! Anne-Marie block size is a personal preference but I like something I can put on a hoop easily so a smallish block is good for me. With really big projects like this I like smaller blocks because the finish quickly – so I have lots of little finishes along the way. It keeps me going I know I have to more smaller blocks but I just like it that way. The I dropped the button box quilt was 6 inch blocks and I did 100 of them. The hexagons have a 4 inch side finished so 7 inches across – this just gives you a couple of ideas as to scale. I finally got my templates. I hope I can use them for the challenge. The stencils are beautiful and the packaging is cute. I can’t wait to use them. Thank you so much for what you do for us. I will save and get the second stencils soon I hope. I also got your book and that is great as well. I started reading it this morning. I love it. Thanks again. Thanks Nora great to hear you are enjoying both! I just received your Crazy Quilting book and looked at the pictures last night. I love it! I have some other books but they don’t give all the lovely embroidery seam combinations that you do. I asked to join the Crazy Quilt Divas for more inspiration. I quilt & hand embroider so I think combining the two would be awesome. Not sure what I’ll make first. Right now I have a long term crochet project in the works so I can’t start until later. I have your stencils already so I hope this fall to try a project. “Hi. This project sounds really fun and might just be the kick I need to start on my crazy quilt! My great grandmother did crazy quilts as a lap project. She had a huge hoop and stitched onto (for her) an old sheet. When she got all the piecing done, she went back and quilted it. I did a hexagon quilt a couple years ago, started with the Take it Further Challenge on this blog. I tried to have all different items, but didn’t count them. I finished each one with backing folded over as binding, then whipped them together. It was in the CQ mag last year. It has been hanging on my wall and has held together so far. I’m toying with the idea of doing the 2020 project with clamshells, still letting the idea germinate. As fast as I sew, it may be a 2025 quilt – only 5 more things but it would give me 5 more years. Clamshells! my goodness I looked at that pattern and thought “now that would be a challenge” It is actually on my stitchers bucket list. Hey I might do the 2020 quilt then start a 2025 quilt if I am not sick of counting! I can’t swear that I’ll do clamshells, but the idea is still there. I did some sketches last night. Sharon, this is all your fault. It is such a great idea I was almost tempted to participate. However, the organisation of it would completely overwhelm me! I do look forward to seeing your progression through this project! Groan! This is a challenge that is perfectly designed to get the creative juices flowing again after completing a major project last year that took all my phylsical and emotional energy but I have just read your suggestions for getting organised and realised that I have one major obstacle and that is that EVERYTHING IS IN STORAGE and likely to stay that way for another 12-18 months. Oh well, I’ll have to put on my thinking cap. You make do. I’ve been doing this most of the last 5 years, seldom being home with my stash. It’s somethat limiting as far as projects, but you can always shop local, if possible, or shop online. Problem is, if you are gone for an extended period of time (in my case over 3 years) your away stash beoomes a problem of portability. In my case I was only able to bring home half of my away stash and will have to travel cross country to retrieve the rest of it. Situation too complicated to explain. So I’m thinking that sashing in between the CQ blocks could count as long as the fabrics used are unique? What a great challenge. Haven’t done much crazy quilting but this does appeal to me, will definitely try to muster up the courage. As the weight of a crazy quilt can be quite heavy with beads and buttons added will the hand stitching of the hexies be strong enough to hold the weight of hanging the quilt? Andrea I have thought of this as the button box quilt is very heavy – with this quilt I am going to try and use less buttons. I will be double stitching all those hexagons and if as the years go by they look a bit weak I will simply stitch them again. Hello Sharon. I am still on the fence having just finished a 2 year quilt for my husband but I do seem pretty interested. What do you mean ‘double Stitching” the hexies? Hello Sharon, This sounds like a fun project – but so sorry – I wont take part in it but will be an onlooker and follower of the progresses with gusto! I put up this question on one of the posts and can’t find it now, so forgive me for repeating myself and making you answer twice. Will you be putting up templates of the blocks you made for the Button Box quilt? It was so helpful and I have used them in a variety of ways..
Well I’m glad I posted that I was planning a Hexie Triangle quilt before you posted your plan Since you posted your 2020 conversation I’ve started to get excited about this project and just realized that not only do I need to figure out my Hexie Triangle layout, but I am going to need 2020 Seams!!! OhMy!! Well ive got an oversized king bedspread to work with and it’s a challenge!! Love It!!!! Going to do the Journal thing too. I already have a stitch journal. Also I will bring my blog back to life and document progress there as well. This proposition is so tempting, and your skilled way of organizing and planning the quilt is fascinating reading. I’d love to join in, but as I mentioned in the TAST interview, I have promised myself not to start new projects until my WIP is finished. I therefore hope to join in, at a later stage. The photos of your preparations are sweet eye candy. Queenie you will always be welcome later on in the challenge as there is no official start date. Thanks Susan – but I dont think its all that brave – I have done the button box quilt which was 2000 items and the 2020 is simply 20 items more so I dont think its all that different. Those that do it – need to be able to keep at it but that is why I am proposing it as a challenge. Many people want to do a big crazy quilt project but fear they wont be able to keep it up – hopefully the group encouragement will help them ( an me) to complete! I NEVER NEVER NEVER ask this question, but I’m going to ask it now. What do you see happening with your quilt once it’s finished? I usually do small pieces because I know how heavy CQs are with all the beads, buttons and baubles. It can’t go on a bed. Who has a big enough wall? I love CQ for the process, but this kind of boggles my mind. Pheeewww!! I’m exhausted just reading all that and my poor brain just lost more grey matter. I shall enjoy watching your progress with great interest. Margaret Roberts – well that is too lady like for words! I was in living room with grandson when I opened the Pintangle e-mail about the 2020 challenge. My grandson asked what I was smiling about. I started read it aloud to him. He was so encouraging and enthused that I have decided to take on the challenge. Like he said ” Neno, you love to design and try new stuff. You need to jump in and just do it.” so, am plotting and planning as I organize my room. Am putting up a design wall and am also going to keep journal of ideas and progress. Let the fun begin!! Carole and all Great to have so many fellow travellers in this project! hi, can you use any shape block or do they have to be hexies? Looking forward to organizing my fabric and bits and bobs and give this a go!! Hi. This project sounds really fun and might just be the kick I need to start on my crazy quilt! My great grandmother did crazy quilts as a lap project. She had a huge hoop and stitched onto (for her) an old sheet. When she got all the piecing done, she went back and quilted it. You said you are going to quilt as you go, which is an excellent idea. I know this from experience. My question is will the backing count as one item and you will use it on each block or will you use a different fabric each time adding to the 2020 total? Yep the backing in one item!